Friends asked me if I could give them some tips on how to decorate the covered patio they had recently build in their backyard; a simple construction apart from the house with a lot of potential. They could easily picture themselves enjoying their new patio, having a drink, good conversations or nice dinners with family and friends but did not know yet how to create the inviting atmosphere they were looking for. I promised them to come up with some suggestions and found great inspiration over the web that I might better as well share with you! As their construction is also made out of wood and they already have two wooden sofa’s with charcoal colored cushions I decided to take that as a starting point and look for extra’s to go with this. 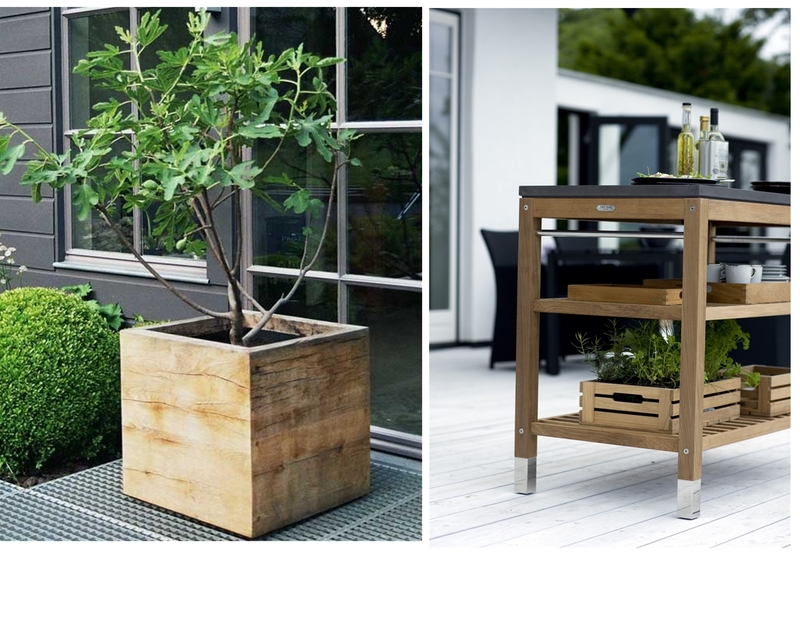 Wooden outdoor furniture is very popular in Holland, preferably made out of reclaimed wood. No wonder as other material can possibly compare to the color, texture, durability and environmental sustainability of reclaimed wood! I personally prefer sectional sofa’s but if you have two separate sofa’s you can easily create this intimate setting by putting a customized square table in the corner. I found some great ideas on how to bring the indoors outdoors as that is exactly what I would like to do. 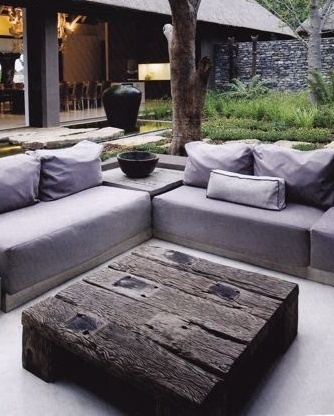 To make the lounging area more inviting I would look for a great outdoor rug. Not only to add ‘coziness’ to the lounging area but also because a rug ties the different pieces together visually. To make guests feel welcome I would definitely add ceiling lights and candles to both decorate and illuminate the patio. My personal choice? An exterior ceiling light from the Dutch brand Frezoli as its industrial look combines perfectly with the sturdiness of the reclaimed wood. 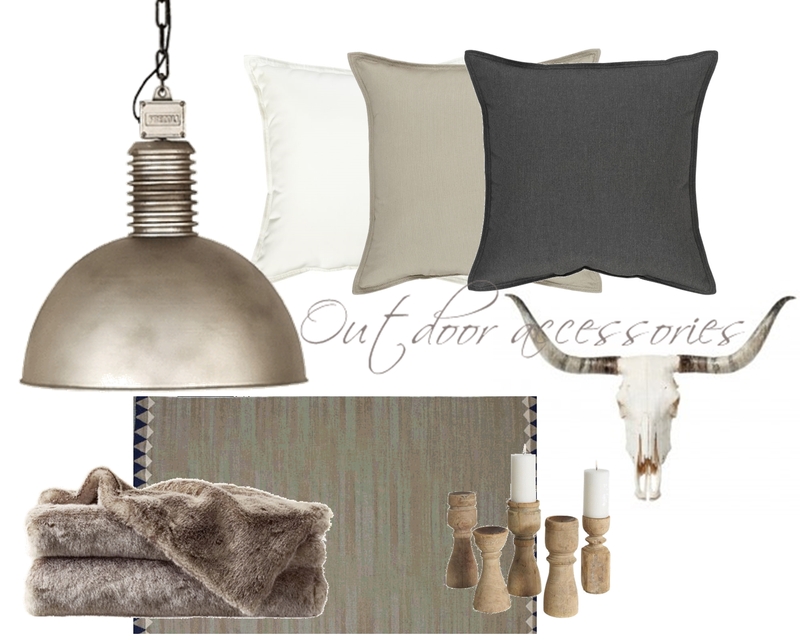 And to make the sofa more comfy I would pick outdoor pillows in different shades of grey and a faux fur throw for the chilly evenings.